Small, cosy pub off Hatton Garden in Clerkenwell. Previously owned by the Spirit Group, it was bought by Fuller's in early 2009. Note that it's closed on weekends, like many pubs in the area. 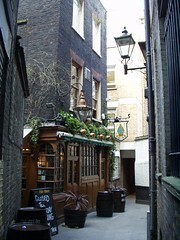 As of autumn 2010, the publican informs us that along with Fuller's ales they also have at least three guest ales every week. The only food available is bar snacks (toasties, pork pies, scotch eggs), but these are available all day from 11:30am-9:30pm. The Old Mitre was the London regional winner in the 2006 Abbot Ale Perfect Pub awards, and the East London & City pub of the year in 2008. It's also on CAMRA's national inventory of historically-interesting pub interiors and offers a nominal discount to CAMRA members. Getting here: Walk up Hatton Garden; between numbers 8 and 9 on the right hand side there's an alleyway. This is Ely Court. The entrance is marked with a blue mitre on the nearby lamppost and a sign for the pub above photo of the blue mitre. Last visited by bob and others, May 2013. Opening hours and food times confirmed by publican, September 2010. Last edited 2018-11-10 14:14:45 (version 45; diff). List all versions. Page last edited 2018-11-10 14:14:45 (version 45).